In DIN 66261, the German Institute for Standardization defined the appearance of Nassi-Shneiderman diagrams. Menu option "DIN?" (or "DIN 66261?") is to turn on a DIN-conform diagram representation. Also note the appearance of different menu icons depending on the setting. 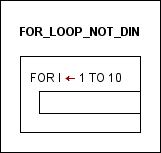 Icon "FOR loop" when checked "DIN?" Icon "FOR loop" when not checked "DIN?" Note: You can alter freely between the settings. The appearance of all diagrams will immediately switch to the new mode. This is no modification of the diagram itself but only of its representation.